"Guys, we're gonna play a festival!" 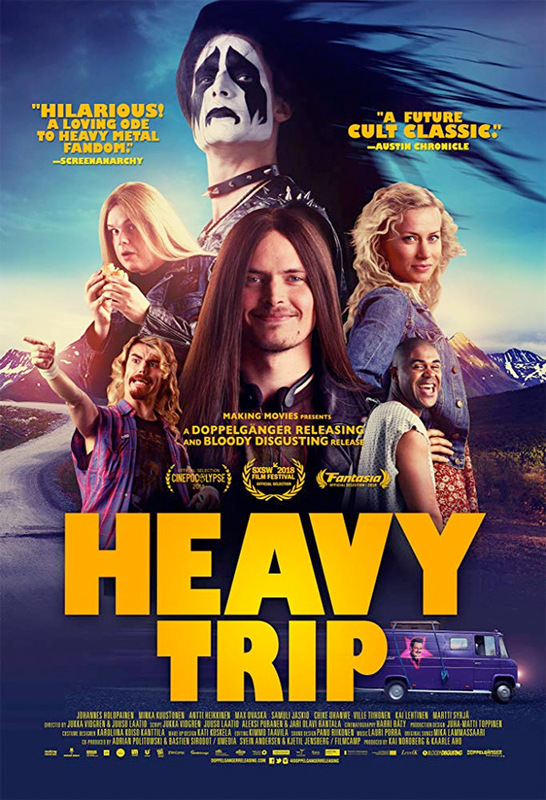 Doppelgänger Releasing has debuted an official trailer for an "offbeat comedy" from Finland titled Heavy Trip, about a heavy metal rock band that goes on a wild road trip to Norway. Turo is stuck in a small village where the best thing in his life is being the lead vocalist for the amateur metal band Impaled Rektum. The only problem? He and his bandmates have practiced for 12 years without playing a single gig. They land a festival in Norway, and decide it's now or never. They steal a van, a corpse, and even a new drummer in order to make their dreams a reality. Starring Johannes Holopainen, Minka Kuustonen, Ville Tiihonen (Hilska), Torstein Bjørklund, and Antti Heikkinen. Well what do you know, this actually looks very funny, the perfect way to make fun of this heavy metal band. Rock on. In this offbeat comedy from Finland, Turo is stuck in a small village where the best thing in his life is being the lead vocalist for the amateur metal band Impaled Rektum. The only problem? He and his bandmates have practiced for 12 years without playing a single gig. The guys get a surprise visitor from Norway -- the promoter for a huge heavy metal music festival -- and decide it's now or never. They steal a van, a corpse, and even a new drummer in order to make their dreams a reality. Heavy Trip is co-directed by Finnish filmmakers Juuso Laatio & Jukka Vidgren, both making their feature directorial debut after a few shorts and other work. This premiered at the SXSW Film Festival, and also played at Cinepocalypse and Fantasia. Doppelgänger will open Heavy Trip in select theaters starting October 5th, VOD the week after.